On Thursday the Christchurch Arts Festival opened & one of the shows that is playing through the festival is Slava's Snowshow. I had no idea what it was really about but thought I would take the boys to one "cultural" show this year. The booklet said that the snowshow had clowns so I thought this might be right up the boys alley especially after they had heard Scott & I talking about Cirque Du Soliel. I bought the tickets online so I was a bit worried that I might have bought seats that had beams or poles in front of them, because they didn't have a map for me to see what seats I was buying. However the boys seemed kind of excited. The excitement when I picked the boys up from school yesterday was palpable, James had been counting down the sleeps since Tuesday & then Brent was very excited when he got in the car because a couple of boys in his class went on Thursday night & had told him it was awesome. We went home & had a couple of chicken drumsticks to eat beacuse the show started at 6pm (a bit of a difficult time when it comes to kids & dinner) & then headed into town to meet up with Scott. We then all walked down to the Issac Theatre Royal. When we stepped into the foyer there was white strips of paper on the floor & a lot of people milling around. We were in the stalls row B seats 7 - 10. The door to our seats was still closed so we bought a couple of programmes & shortly after the doors opened. We went in & the usher told us we had wonderful seats & she was right! We were in the second to front row, Scott sat in the aisle seat so kind of over to the side, but not where we couldn't see. In fact we were very close to a speaker stack that was playing the sound of a train coming in & leaving a station. It was quite loud but not scary. There was white paper on the floor & a bit on the seats & we wondered what we were in for. The show started with that train music & dry ice that floated off the stage & covered us. James sat next to Scott & cuddled his jersey & blocked his ears but he couldn't hide his eyes, he was mesmerised. Brent was just as mesmerised but he sat through it all & didn't flinch until he got some water sprinkled at him. I won't go into much more detail in case some of you get to go. There was some loud music that went right through us (probably because we were so close to the speaker stack) & James got scared once when a clown came off the stage & climbed on to the seats right next to him. Otherwise it was a fantastic show! The boys both loved it & at the end they went & shook the clown's hand, because he was just sitting on the stage beside us. 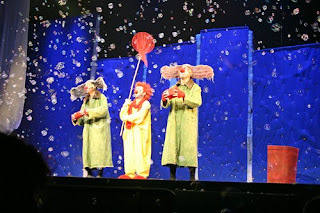 This photo is in the 1st half of the show & those are bubbles that the clown is catching in his net. Those bubbles came towards us & the boys just had fun popping them & watching them. I have to say this is one show that I would recommend front row seats for. We didn't have to crane our necks & the front rows can almost become participants which makes it very exciting for the children but also for the adults that want to be child like for an hour & a half. People were saying it was better than Cirque du Soliel I just say that they are 2 different shows. Cirque has different people doing a range of different circus feats, this show was about 6 clowns who mimed & let us enjoy being childlike for a while. Thursday 24 July - Progress! Tuesday 21 July - Look what we've got! Friday 17 July - Excitement! Sunday 5th July - Bye Dad! Thursday 2 July - Trusses have arrived!